While most of the highway shops in Otaki sell ‘outlet’ goods, there are some that are worth a second look. Katie Brown’s gallery of hand-made glass is one. Here she showcases work from a number of talented Whanganui artists. 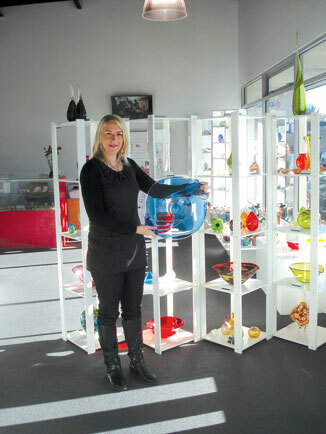 Whanganui has a reputation as the most vibrant art glass community in the country, with over 40 glass artists, many galleries and glass workshops. Katie Brown is one of a handful of full-time female glassblowing artists in New Zealand. 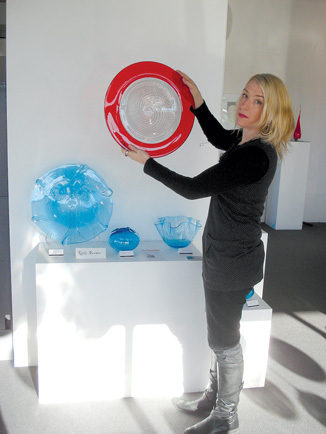 Graduating with a Diploma in Glass Design and Production in 1999 at Whanganui Polytechnic, Katie now co-owns and blows glass at Chronicle Glass Studio – the only “open” glass studio in the lower North Island region. Whilst studying, Katie met internationally renowned American glass artist Josh Simpson, and was invited to travel to Massachusetts to become part of his glass making team. 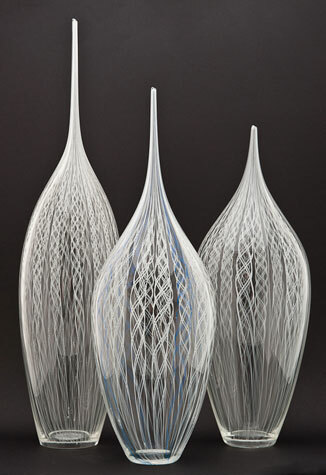 After three years working in the United States, Katie moved to England where she worked with several glass makers, including environmental glass artist Neil Wilkin. Working with Wilkin proved to be a pivotal time in Katie’s career, enabling Katie to produce her own work, gaining invaluable tutelage in the process. Since 2003, Katie has dedicated her time to helping Chronicle Glass to become operational as a full-time open studio. The space is well-suited to public viewing and invites participation in the glassblowing process. Much of Katie’s work is inspired by the natural world and this is reflected within her use of hot glass. Through her use of colour and cold techniques her pieces display a delicate sense of structure. Katie’s work reflects her versatility producing a variety of pieces ranging from production work, to her exclusive sculptural pieces and her one-off chandelier commissions. Chronicle Glass in Wanganui have two-day glassblowing courses. For $390 you get one-on-one tuition, and a hands-on opportunity to make paperweights, cups, bowls & plates. Several Otaki people have enjoyed these classes, producing work that is a guaranteed conversation-stopper. It’s a fantastic opportunity to realise the artist in you! In the Otaki gallery, Katie’s work is displayed, from inexpensive paperweights, vases and plates right through to her latest passion, chandeliers and wrought-iron fusion. 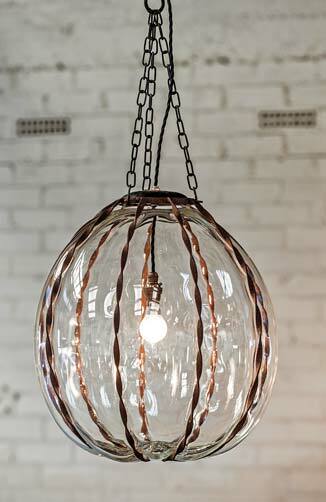 In partnership with Graeme Kiff, who makes elaborate wrought-iron cages, Katie produces exotic glass hanging lights. The process requires her to stand on a table with 3Kg of molten glass on her blowpipe, which is the blown into the cage, extruding beyond the iron frame. Also on display are the work of Whanganui glass artists Lyndsay Patterson, Lewis Batchelar, Greg Hall, Kirsty Winton and Ivan Kostinar, and Chris Jones from Taupo. Hand-made glass objects can be purchased from $30 for love heart paperweights, up to $thousands for more exotic pieces. Definitely worth a visit!